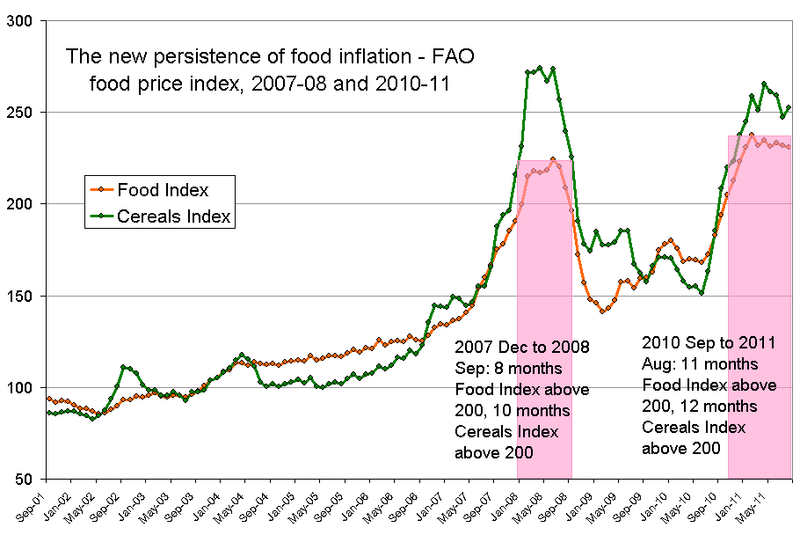 Using the just released FAO food index update for 2011 August, I have compared the two periods of high food prices, the earlier one in 2007-08 and the continuing period of 2010-11. Between 2007 Dec and 2008 Sep: for 8 months the Food Index was above 200, and for 10 months the Cereals Index was above 200. Between 2010 Sep and 2011 Aug: for 11 months the Food Index has been above 200, and for 12 months the Cereals Index has been above 200. This is the longest period in the last ten years that the FAO food index has been at such a level. This is the backstory of the FAO Food Price Index. Let’s turn to what the FAO has said about the 2011 August update. World food prices remained virtually unchanged between July and August 2011. The Index averaged 231 points last month compared to 232 points in July. It was 26% higher than in August 2010 but seven points below its all-time high of 238 points in February 2011. Within the index, cereals prices rose, reflecting the fact that although cereal production is expected to increase, it will not do so by enough to offset the additional demand, so that stocks continue to be low and prices continue to be high and volatile. The FAO Cereal Price Index averaged 253 points in August, up 2.2%, or 5 points, from July and 36% higher than in August 2010. However, the firmer cereal prices were largely offset by declines in international prices of most other commodities included in the Food Price Index, oils and dairy products in particular. Cereal price rises stem from a supply and demand balance that remains tight despite the anticipated increase in production. 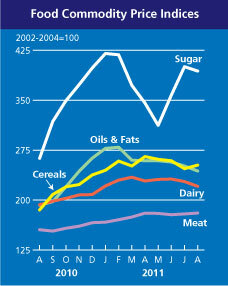 World cereal production in 2011 is now forecast to reach 2,307 million tonnes, 3% higher than in 2010. But this latest forecast is nearly 6 million tonnes lower than the previous forecast published in July. Among the major cereals, the maize supply situation is a cause for concern following downward revisions to maize crop prospects in the United States, the world’s largest maize producer, because of continued hot weather in July and August. Average wheat prices were also up 9% in August given the strong demand for feed wheat and shrinking supplies of high quality wheat. Nonetheless, world wheat production is forecast to increase by 4.3% (or 28 million tonnes), only 4 million tonnes below the 2009 record. World coarse grain production is still heading for a record level of 1,147.5 million tonnes, up 2.4% (or 27 million tonnes) from 2010, in spite of lowered maize production prospects in the United States, the world’s largest maize producer. Rice prices also gained with the benchmark Thai rice price up 5% from July, driven by a policy change in Thailand, the world’s largest rice exporter, where paddy rice will be purchased from farmers at above market prices. Global rice production prospects remain favourable, however, with output set to reach a new high of 479 million tonnes, up 2.5% from 2010. 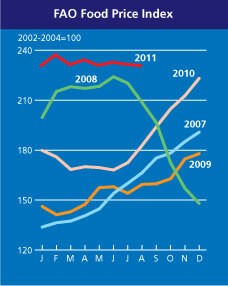 Total cereal utilization in 2011-12 is forecast to increase by 1.4%, almost matching anticipated 2011 production. As a result, global cereal inventories by the close of seasons in 2012 are likely to remain close to their already low opening levels. Only rice stocks are expected to increase significantly, supported by record production. Wheat inventories are likely to decline to their lowest level since 2009 and world stocks of coarse grains are also forecast to plunge, with maize inventories falling to 124 million tonnes, their lowest level since 2007. Given the tight global supply and demand balance for coarse grains, its stocks-to-use ratio is forecast to fall to a historical low of 13.4%. The FAO Oils/Fats Price Index averaged 244 points in August, following a declining trend since March but still remaining high in historical terms. The FAO Dairy Price Index averaged 221 points in August, significantly down from 228 points in July and 232 points in June, but still 14% higher than the same period last year. The FAO Meat Price Index averaged 181 points in August, up 1% from July. The FAO Sugar Price Index averaged 394 points in August, down 2% from July, but still 50% higher than in August 2010. The International Grains Council (IGC) in its end-August 2011 Grain Market Report has said that world grains production is expected to rise significantly from last year’s reduced outturn, but the forecast is lowered from July due to a sharp cut in the US maize crop estimate. While a downward adjustment is also made to the 2011-12 consumption forecast, global end-of-season grain stocks are nevertheless placed lower than before, projected to decline by 4% from their estimated level at the start of the season. Total production is now forecast at 1,808m. tons, down by 9m. from the previous month but still significantly higher than in 2010-11 (1,748m.). While the wheat crop figure is raised by 3m. tons, to 677m. (651m. ), the world maize production forecast is reduced by 10m. tons, to 849m. (824m.) because of the further decline in US yield prospects. In view of the tightness in the US maize market, with prices likely to stay firm, also in relation to wheat, feed use of grain is placed 3m. tons lower than before, at 766m., but still up from the past year’s 749m. Global feed use of maize is trimmed by 4m. tons, but that of wheat is placed slightly higher than before, at a twenty-year peak of 125m. tons, reflecting ample availabilities of lower quality grades. With the reduction in the global production total only partly absorbed by a cut in the consumption forecast, the projection of world carryover stocks in 2011-12 is reduced by 5m. tons, to 342m. This would represent a drop of 16m. tons from the estimated carry-in level, mainly due to the expected decline in maize inventories. In particular, end-season stocks in the eight major exporters are projected to fall to 112m. tons, down from 128m. at the start of 2011-12 and from 170m. the year before. These would be the smallest since 2003-04. The global trade forecast for grains in 2011-12 is almost unchanged at 244m. tons, up 1m. from the year ended this June. Bigger than previously projected imports lift the wheat figure by 1.5m. tons, to 128.2m., but this is balanced by a reduction for maize trade, now placed at 92.7m. tons. The substantial recovery in Black Sea region supplies will result in a major shift back to this origin, especially for wheat, with the downturn in US maize exports also partly offset by expected record Ukraine shipments of this grain. WHEAT: World wheat supply and demand are forecast to be broadly balanced in 2011-12, with a rise in production matched by higher use. With winter wheat harvests nearing completion in the northern hemisphere, better than expected results in the EU, CIS and China outweigh the somewhat reduced prospects in the US and Australia, and the forecast of world production is raised by 3m. tons, to 677m. (651m.). Much of the rise in supply compared with last month is absorbed by a further increase in projected feed wheat demand, contributing to a larger than normal year-on-year upturn in total world wheat consumption, to 678m. tons (657m.). The global carryover is expected to be broadly unchanged, placed 1m. tons higher than in the last Market Report, at 191m. However, stocks of the highest-protein milling wheats are expected to tighten, especially in the US and Canada, contributing to a 3.9m. ton fall in the combined carryover in the eight major exporters, to 64.6m. This is up by 2.0m. tons from last month’s figure, including larger projections for the EU, Kazakhstan and Ukraine. MAIZE (CORN): The US crop forecast is cut sharply from last month, but production prospects in the southern hemisphere have improved and the 2011-12 maize crop is still projected to be the largest on record at 849m. tons (824m.). Demand is expected to increase, but at a slower pace. Growth in feed use will be limited mainly to developing countries, with meat output in most industrialised nations likely to increase relatively slowly due to high feed prices and flat demand. Growing supplies of competitively-priced lower grade wheat will limit demand for maize, while use of distillers dried grains (DDG) will also remain high. After rising sharply in recent years, maize used for the manufacture of fuel ethanol is forecast to show very little growth, with the figure for the US projected to be unchanged from 2010-11. EU import needs are seen lower than before and, with some buyers in Asia likely to further boost feed wheat purchases, the 2011-12 world trade forecast is trimmed by 1.4m. tons, to 92.7m., almost unchanged from last year. RICE: World rice production (milled basis) in 2011-12 is projected to increase by 2%, to a record 457m. tons. This assumes larger outturns in Far East Asia, including in India, where prospects for this year’s kharif crop are generally favourable. Increased supplies should also enable a further rise in that country’s consumption, with world use forecast to expand to an all-time peak of 457m. tons. With global production and consumption expected to be broadly in balance, the 2011-12 carryover is set to show little overall change, at a nine-year high of 99m. tons. Within the total, inventories in the five major exporters are expected to climb to 30.9m. tons (29.2m.). World trade in calendar 2012 is projected to expand by 1%, to a record 32.2m. tons, with larger shipments to several countries in Asia and sub-Saharan Africa. SOYABEANS: World soyabean production in 2011-12 is projected at 258.1m. tons, a decline of 3% from last year, mostly reflecting prospects for a smaller US outturn. Solid demand from Asia (China) will spur further growth in world trade in 2011-12, forecast to rise to a record 96.4m. tons (92.5m.). Global soyameal trade is placed at 60.3m. tons (58.3m. ), the year-on-year expansion resulting from bigger purchases by the EU and Far East Asia.